For the most part, our food inspiration comes from what I would consider pretty places. Beautiful pictures on blogs or in magazines, or cooking shows with a host that has excellent taste and uses brightly colored seasonal ingredients. This dish however was the completely opposite. It came to us while we were watching the third season of Bizarre Foods on Netflix. Andrew Zimmern was strolling the markets and countryside of Northeastern Thailand to see how people made the most of what they had. In this case it was eating something that resembled a mole. While he tried to eat it plain and was completely repulsed, he then sampled it as part of a stir fry with lemon grass, curry powder and chiles and remarked that ANYTHING can be made delicious with those three ingredients. We’d been looking for an excuse (as if we needed one) to cook with lemongrass for some time and let me tell you, I’m embarrassed because we have been missing out. 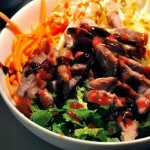 This recipe isn’t really Thai, but really more Vietnamese. 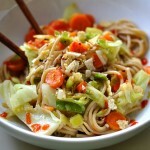 It’s an adaptation of Ga Xao Xa Ot in which we’ve substituted tofu for chicken. 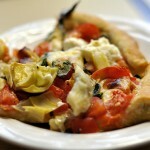 It was adapted from a base recipe we found in Food & Wine. 1. 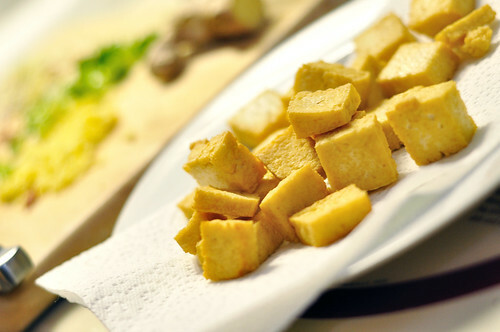 Slice the tofu in 1 ½-inch pieces. 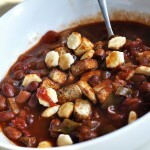 Place in a bowl, sprinkle with Braggs, and shake or stir. Marinate for as little as five minutes or up to an hour. Add additional spices as you prefer. 2. Heat the oil on medium/high in a heavy non-stick frying pan or well cured cast iron pan. 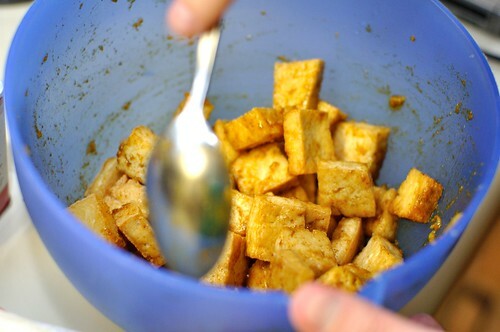 Add the tofu, and fry each side for 5 minutes or until brown and crispy. Remove and set aside. 3. 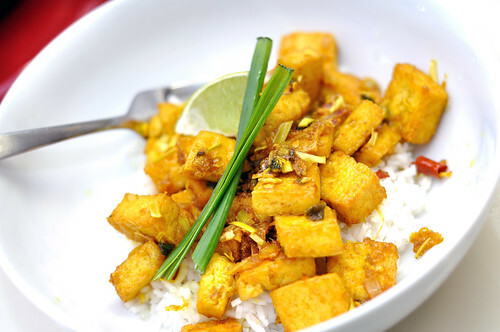 In a bowl, combine the fish sauce, garlic, curry powder, salt and 1 ½ teaspoons of the sugar. 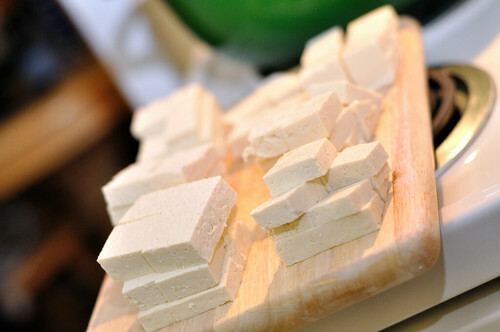 Add the tofu to coat. 4. In a small skillet, mix the remaining 2 tablespoons of sugar with 1 tablespoon of the water and cook over high heat, stirring, until the sugar is dissolved. Cook without stirring until a deep amber caramel forms, about 2 to 3 minutes. Remove from the heat and stir in the remaining 2 tablespoons of water. Transfer to a very small heatproof bowl. 5. Heat a wok over high heat. Add the oil and heat until shimmering. 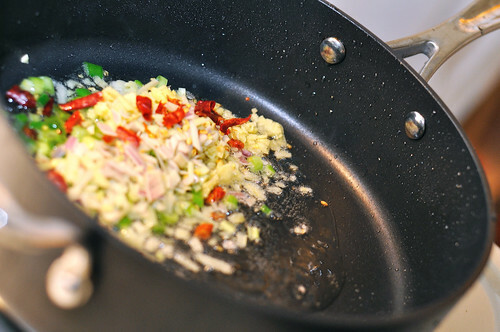 Add the lemon­grass, shallot and chiles and stir-fry until fragrant, about 1 minute. 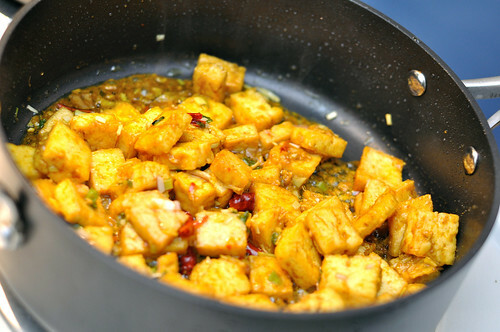 Add the tofu and caramel and stir-fry over moderate heat until the cooked through and the sauce is slightly thickened, about 8 minutes. Serve with rice. Fair warning, this has some kick to it but it’s so worth it. The curry powder gives it almost a nuclear yellow color that I wish I could have captured better in the pictures. It definitely had us in awe. Up until now we thought only boxed macaroni and cheese and Crayola could create such a color. I wish we would have had the cilantro on hand, and I think in another variation I’d double the caramel sauce created in step 4 to give it an allover better coat. 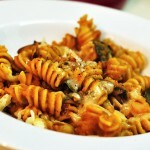 I’d also add a little coconut milk, another ingredient we’ve been pining to try. All things considered though it was a light and super fresh dish for a weekday night in January when you have cabin fever and think winter will never end. Jessica, this looks really good! I am a huge fan of lemongrass, I got a wok for Christmas, and I have a block of tofu in the fridge that needs to be cooked. I seriously think I will try this this weekend. This is my favorite dish. My mom makes its all the time, she makes it differently though. Its is so good!! !